Buying themed lacing cards can get expensive but it is so easy to make your own. All you need is to buy foam sheets. You can often pick up foam sheets in packs at the dollar store or you can buy individual ones at a craft store. To make your own lacing cards, cut the foam sheets into shapes. You can do this easily by cutting simple shapes like circles, squares and triangles with scissors or you can make more elaborate shapes. To create more elaborate shapes, lay a shaped cookie cutter or stencil on top of the foam sheet, trace with a pen or pencil and cut out. Next, hole punch around the outside of the shape at regular intervals (you may want the holes closer together or further apart depending on the ability level of the child). 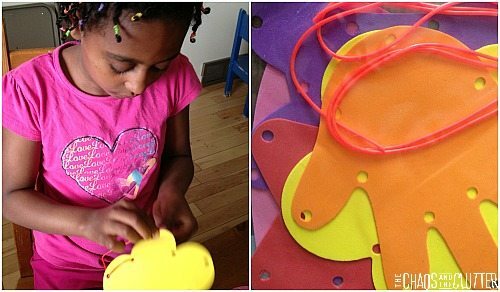 Place the hole punched shapes and some plastic lacing string into a resealable bag. This creates a lacing card busy bag that can be taken with you anywhere and is a great quiet activity as well as good fine motor practise. You can also create several of these busy bags, each one having a theme. You can use farm cookie cutters to make farm lacing cards or use dinosaur stencils to make dino theme lacing cards. If you are looking for more busy bag ideas, you may be interested in following my Activity Bags board on Pinterest. Follow Sharla Kostelyk’s board Activity Bags on Pinterest. The best kinds of activities are the ones that don’t take a lot of money, planning or supplies because they are the ones that are actually feasible for most moms to do. I spend time on Pinterest finding awesome crafts and activities to do with my kids but I know from experience that the ones that I’m going to have to go out and buy a lot of supplies for or spend an hour doing prep work for aren’t likely to actually happen. This simple sewing busy bag only needs a few items to assemble. 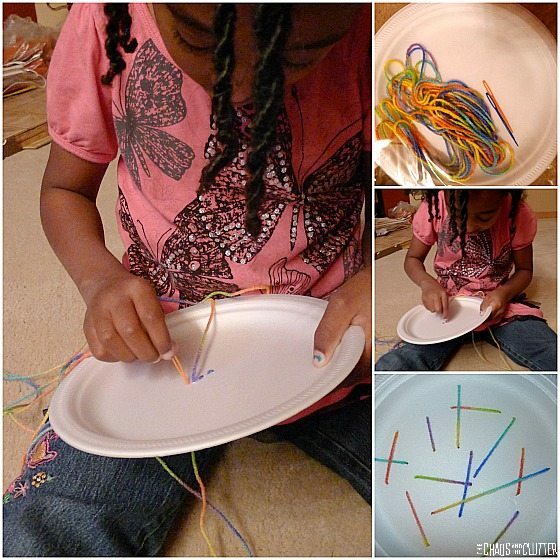 To create this busy bag, put a few foam plates in a resealable bag with two or three plastic sewing needles. Cut some lengths of yarn, some shorter, some longer and add them into the bag as well. Seal the bag and the activity is ready for your child. 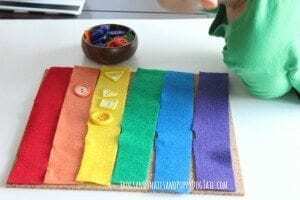 Not only is this a nice quiet activity that can be used to keep your child busy in a waiting room, in the car or while older kids are homeschooling, this also teaches early sewing skills. 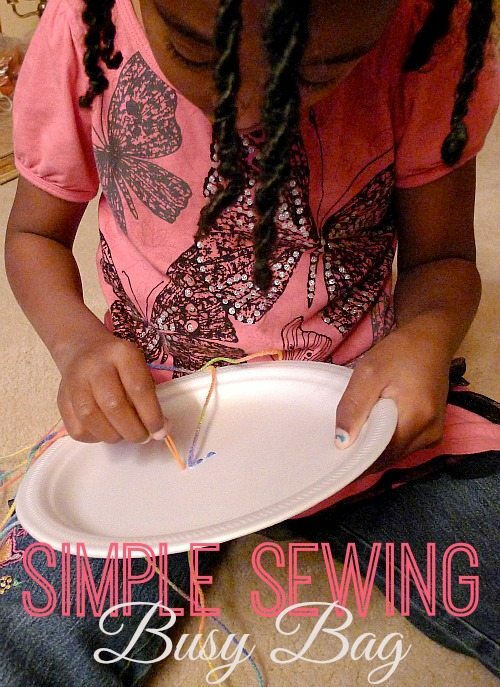 Depending on the age of your child, you may have to help them get started with this activity by demonstrating how to thread the needle and by putting a knot in the end of it (older children can easily do this by themselves). You can then show them how to sew by poking the threaded needle through the back of the plate and coming down through the front of the plate. 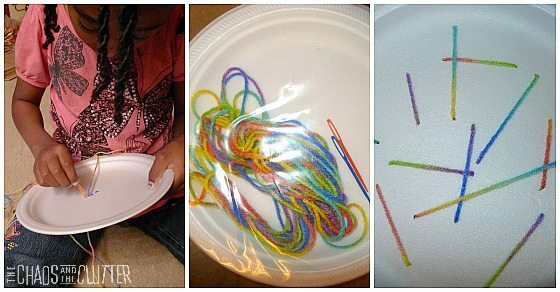 Younger children can “sew” random lines on the plate, creating a bit of a spiderweb look while older children can practise smaller stitches and sewing in a straight line. Our daughter Dancing Queen began by sewing large overlapping lines on the first plate but as her confidence grew, she tried smaller stitches next to each other to form lines on later plates. She was really proud of her efforts! Busy bags do not have to only be enjoyed by pre-schoolers. They are a great tool for elementary aged students for reenforcing learning concepts and creating a quiet activity for them to do on their own. Busy bags are one of the things I always bring with me in my little waiting room survival kit. They are also a good tool for the times when I need to work one-on-one with one of the kids and need something to occupy the other ones. This particular busy bag is not only great for reenforcing the current sight words or spelling words that are being learned, it also costs nothing to make. 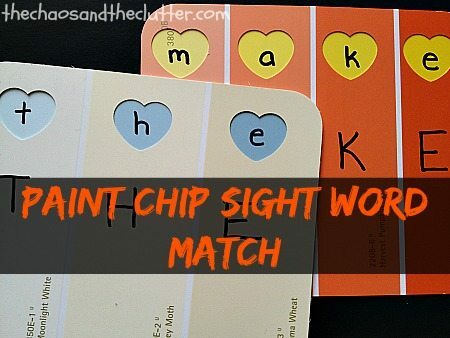 In order to create these sight word cards, you will need two paint chips per word. Punch large holes in one of them. I used a heart shaped punch, but regular squares or circles would work just as well. Next, lay the card with the holes punched in it on top of the other card so that you will be able to line up the words properly. Write lowercase letters on one card, through the holes made, and uppercase letters of the same word on the other. Place them all into a resealable bag for easy storage. This also makes them easy to transport. 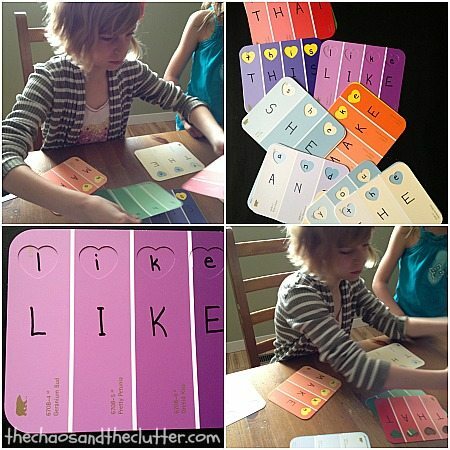 The activity is much more challenging if you use different colours of paint chips for the two parts of the word so that the kids have to match them up based on the letters and not based on colour. It’s a good idea to make some blank cards while you have the supplies out so that you are able to add more words as your child begins to expand their sight word repertoire. We love busy bags! 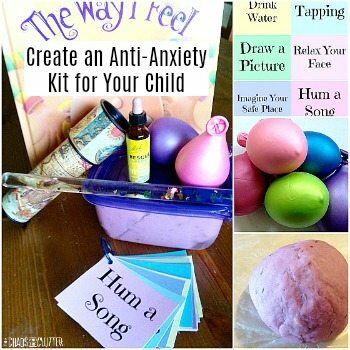 I use them all the time at home with our youngest while I am homeschooling the older ones and pack them to take with me whenever we are going to an appointment and may be spending time in a waiting room. We also use busy bags when traveling and my oldest daughter includes them in her Babysitting Kit. 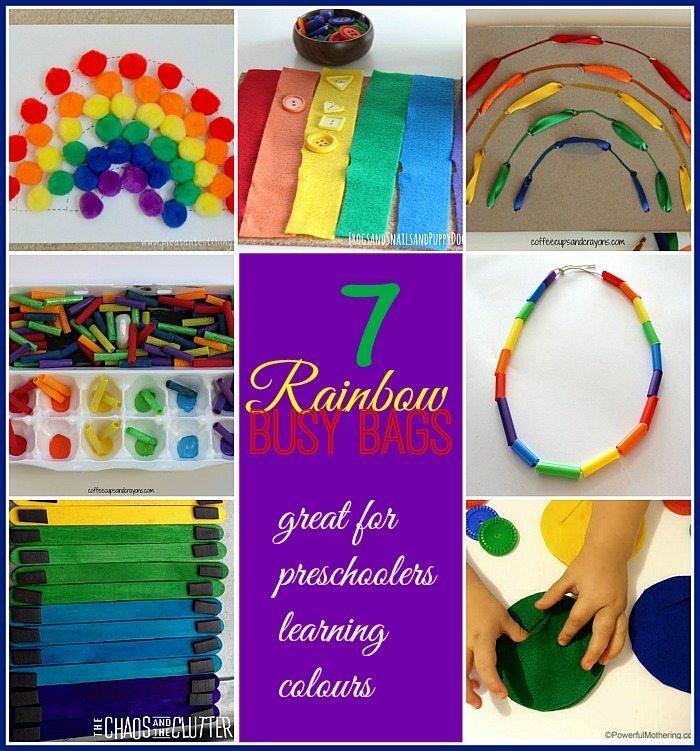 I also love bright colours, so these rainbow busy bags are some of my favourites! I’ve included a variety of ideas some of which take moments to prepare and some which take a bit more prep time. Two things they do have in common though is that they are colourful and that they will be well loved by your little ones! 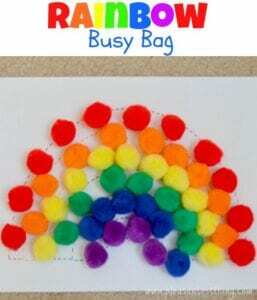 You can also find more of our family’s easy Rainbow Busy Bags in our 7 Busy Bags for Teaching Colors and 7 Busy Bags Made with Paint Chips or by following my Activity Bags board on Pinterest. 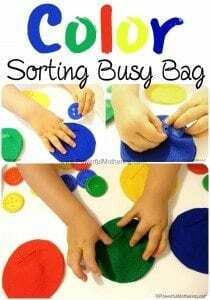 This is a really easy busy bag to assemble and has great bright colours. The sticks can be lined up to create a rainbow or they can be used to make shapes. 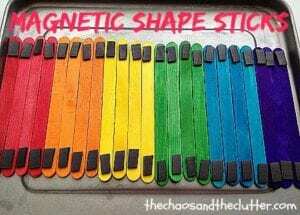 To make this as simple as possible, you can buy coloured popsicle sticks, but you can also extend the activity by using plain popsicle sticks and having your child help you paint them. Once dry, you can then create the busy bag. 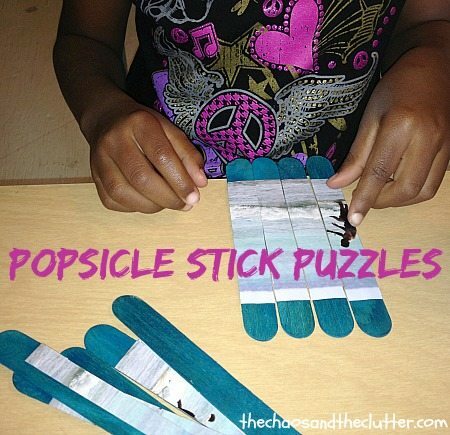 To create this busy bag, simply attach magnet pieces to each end of the popsicle sticks. I used the adhesive kind of magnet strip, but I found that I still needed to glue them in place as the adhesive didn’t hold well enough. 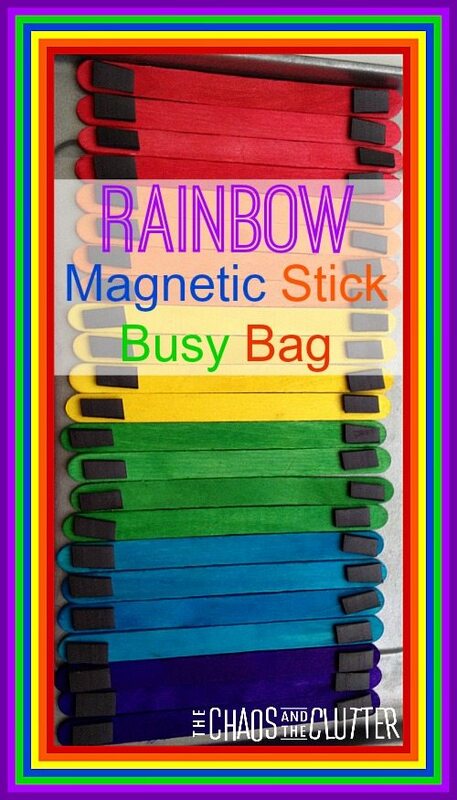 Place the now magnetic sticks in a large resealable bag with a mini baking tray or the lid from a tin container. The sticks can now be used to create shapes and patterns. They can also be used as tally marks when counting or playing other games. They can be used to play on the fridge or any other magnetic surface such as a white board or an outside door. 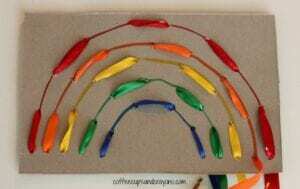 This is a great teaching tool for reinforcing shape and colour concept with preschoolers. Of course, as with all kids’ activities, caution and proper supervision should be used. 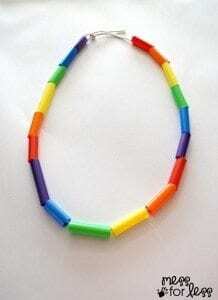 The magnetic pieces could be a choking hazard to young children. Busy bags are a great tool for moms to use to occupy younger kids while they are doing an activity or schoolwork with older kids. They also work well for waiting rooms and road trips. There are all sorts that you can make but if you’ve read our other busy bag ideas, you may have noticed that I like to keep my ideas simple and cost effective. The only reason I am able to have two boxes filled with busy bags for Dancing Queen to play with is that I was able to make them quickly and easily. 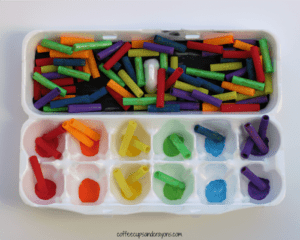 To prepare this busy bag, attach magnet pieces to each end of the popsicle sticks. I used the adhesive kind of magnet strip but I still needed to glue them in place as the adhesive didn’t hold well enough. Place the now magnetic sticks in a large resealable bag with a mini baking tray or the lid from a tin container. The sticks can then be used to create shapes and patterns. Your child can also use the sticks to play on the fridge or any other magnetic surface such as a white board or outside door. 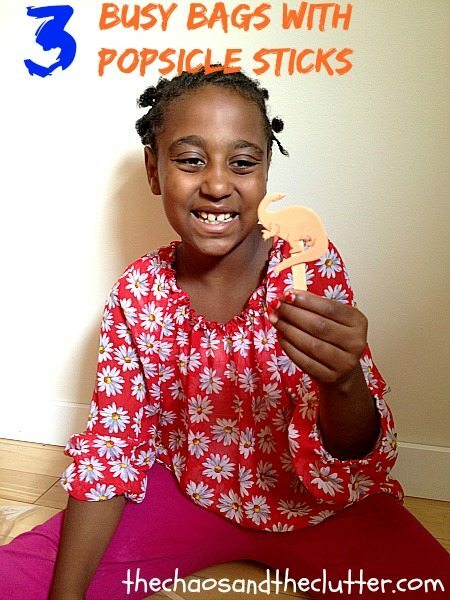 Kids love these because they can be personalized. They get especially excited when they include pictures of people they love or treasured family memories. On most of ours, I used pictures from past family vacations. This way the kids can relive those memories while they put together their puzzles. They can also put the puzzles in chronological order. Another great thing you can do when creating these is to make them with emotion cards or large faces clipped from magazine. 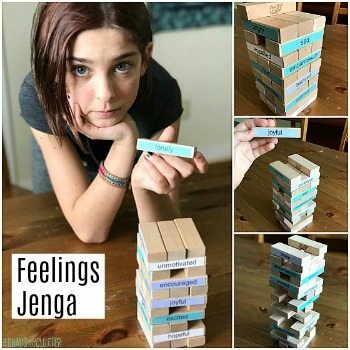 These can become a great tool for kids with autism or kids who need extra help in learning to identify emotions. To make these busy bags, lay wide popsicle sticks side by side and glue a photo, emotion card or picture from a magazine on top. Allow the glue to dry. 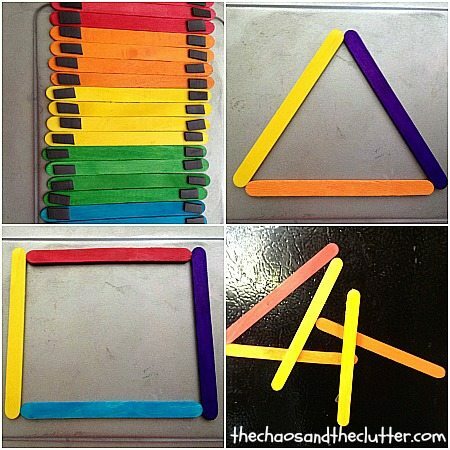 Using an exacto blade or scissors, cut the popsicle sticks apart. Put them into a resealable bag and kids can piece the puzzles together. The great thing about this busy bag is that it lends itself to all kinds of creativity. All you have to do to prepare this activity bag is to place popsicle sticks and foam stickers in a resealable bag. This is a great way to use up all the extras from other foam sticker activities or you can choose to use ones of a particular theme. 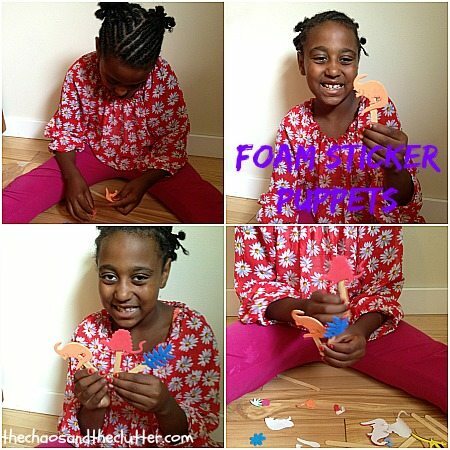 Your child can then make puppets using the foam stickers and do all kinds of creative play using their puppets. For older kids, you can also include some fine-tip permanent markers in the bag for them to add details to their puppets. 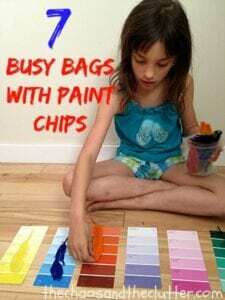 If you are looking for more busy bag ideas, you may want to follow my Activity Bags board on Pinterest or if you are just looking for some great ideas for kids, you may want to follow my most popular Pinterest board, For Kids. 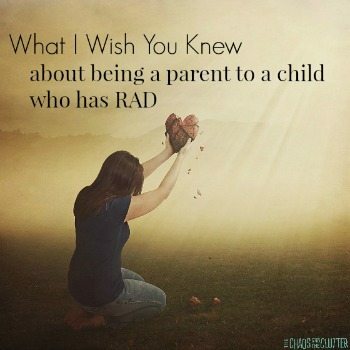 Follow Sharla Kostelyk’s board For Kids on Pinterest.